New York City's sewers have been seeing a lot of bling lately. 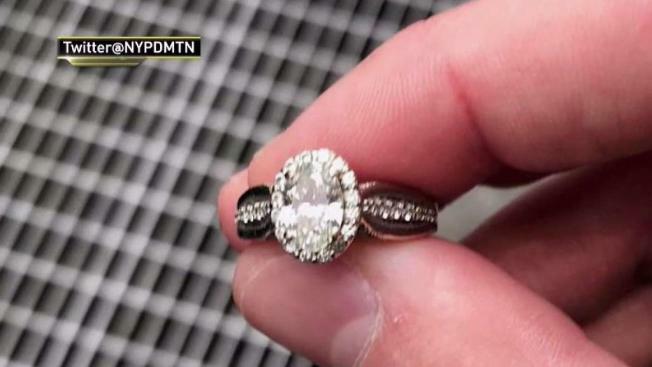 Police helped retrieve another ring from a sewer grate, just about a month after a newly engaged couple dropped their ring down a grate in Times Square. That ring was returned to the pair in a high-profile handoff on "The Ellen DeGeneres Show." The latest bauble was dropped Thursday night down a grate just a few blocks from Times Square, on Eighth Avenue and 48th Street, the NYPD said. The woman, who didn't want police to reveal her identity, said the ring slipped off her finger as she left a nearby bar. She sent an email to police the next day and officers spotted the ring down the grate, police said. A police emergency services unit and the FDNY recovered the ring. The ring was returned to its grateful owner Friday night, police said.